Walk through any Sonoma County small-business shopping district and you'll see Go Local signs in many shop windows. Still in its infancy, the movement that exhorts people to shop locally has gained widespread recognition in a relatively short period of time. But while buying local might make people feel good about themselves and their progressive life choices, the question remains: What does it really mean economically when one purchases something sold, and possibly manufactured, locally rather than the same product sold at a Walmart and manufactured in a fire-prone Bangladeshi factory? "It does have an effect," says Dr. Robert Eyler, economics department chair at Sonoma State University. "In nonlocal businesses, the revenue goes away from the local area and any residual left remains outside." 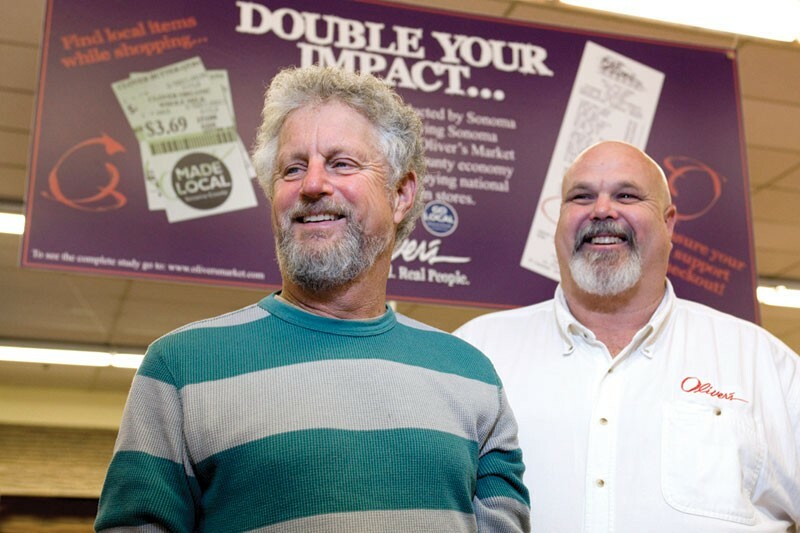 According to "The Economics of Local: Oliver's Market as Case Study," a 2011 report by SSU's School of Business and Economics, for every purchase of local goods at a local store, there is at least a 32 percent larger economic impact on the county. The bottom line is that the choice of a locally owned store over a big-box can mean a thriving interdependent local economy instead of one where sales taxes are among the only economic benefits that don't "leak" out of state, into the coffers of whichever corporation is at the helm. "They're like miners, coming here and taking the gold out of our city," says Terry Garrett of Go Local, likening corporate chains to "wealth-extraction units." Keeping the value chain—from supplier/producer, to distribution, to retail sales, to local buyers—contained completely within a local area is key to a strong economy, according to the SSU report. When any part of the chain is broken, "leakage" occurs, meaning money that could have been funneled back into the local economy instead exits the area completely, never to return. "If the local economy buys goods only from nonlocal businesses, none of the business revenue beyond the local expenses remains local," says Eyler. "It is, however, important to recognize that local economies are best off when exporting the maximum amount of goods and services, but we need flows in and out to provide choice and breadth of goods and services, which means leakages can never be zero. Minimizing leakages where possible is the best economic-development strategy." The "economic multiplier process" should not be underestimated, says Garrett. When someone makes the choice to buy from a local retailer, the recirculation into the community ends up being around 35 cents for every dollar, he says. This can translate into millions of dollars in business revenue for the county; additionally, recirculation often comes in the form of jobs. "The hiring of accountants, lawyers, graphic designers, public relations people, ad agencies, printers, even cleaning supplies—that's where the multiplier effect really starts to kick in," adds Garrett. Tom Scott, vice president and general manager of Oliver's Market, headquartered in Rohnert Park, says that his company uses about 107 local ancillary services, from the printing service that handles the paper bags to the place where he buys toilet paper for the bathrooms. In addition, the store pays about 393 full-time-equivalent employees, and 275 more part-time employees. Making the economic multiplier viable is the fact that the public reacts well to products manufactured locally. In 2010, Oliver's began marking locally made items—products made in Sonoma County—with "Made Local" signs. Customers responded with an increase in purchases, and though only 11.5 percent of the store's 45,000 shelf items are local, these products account for 25 percent of total sales. Also, local sales are growing at a 10 to 15 percent faster rate than nonlocal items, a statistic easily tracked through the SKUs that mark each particular item, says Scott. But like Garrett, Scott agrees that the real power lies in the multiplier effect. "Say you're buying Peet's Coffee, which is now owned by a German company. Well, that money goes to Germany," Scott explains. "The money's not regenerated here. If you buy the same pound of coffee from Taylor Maid or Bella Rosa, you're making the same cup of coffee but expect that your neighbor has a job because of that." The economic incentive to market "local" products has even moved into nonlocal stores, which might be seen as a victory for the movement but has drawn ire from some farmers and their advocates. Go into the produce section of a local Safeway and, depending on the season, one might see a "Locally Grown" label on oranges or peaches. On Aug. 30, Anthony Cohen, a Santa Rosa attorney, sent a letter to Safeway senior vice president Robert Gordon, alleging possible unlawful competition and consumer fraud. "A Sonoma County jury would be no more likely to find that oranges grown in Bakersfield orchards are 'locally grown' than it would be to find that those orchards are 'locally owned,'" writes Cohen. In September, Cohen received a response from Valerie Lewis, senior corporate counsel at Safeway, who said that Safeway considers locally grown being anything from California, and that small growers couldn't provide the amount of produce needed by the stores. But the issue isn't a matter of distribution, but misleading marketing, says Cohen. In a phone conversation, he says that a recent visit to Safeway in Guerneville revealed peaches prominently advertised as locally grown, even as they originated in Reedley, Calif., outside of Fresno. "It's unfair, because these are deceptive business practices," he says. Support for local food systems and commerce has become a priority of local government as of Oct. 23, when the Sonoma County Board of Supervisors approved the comprehensive Healthy and Sustainable Food Action Plan created by the Sonoma County Department of Health Services and the Food System Alliance. The section titled "Economic Vitality" contains a call for "expanding the capacity of the local food supply chain to create more jobs in Sonoma County," along with "building in a preference for purchasing Sonoma County and regional products." If trends continue, and consumers and local government increase focus on the real economic value of keeping it local, say advocates like Terry Garrett, a change in habits—and a boost in the county's employment and tax income—could be just the way to boost the local economy.